If quantum computers are ever to be realized, they likely will be made of different components sharing information with one another, just as the memory and logic circuits in today's computers do. Yet, it remains unclear how the quantum states in these different systems interact. A team of JQI physicists (supported by PFC) has shown for the first time how these parts might communicate effectively using photons from these different states. Even though the photons from these states are vastly different they can be made more similar, demonstrating a first step toward permitting disparate quantum information components to communicate with one another. The JQI researchers have now succeeded in this effort. They use photons emitted from two different types of quantum devices, a parametric down converter (PDC) and a quantum dot. While the photons are initially distinguishable, they can nevertheless, be made nearly indistinguishable in terms of spectra, location and polarization, allowing them to coalesce into a single quantum state. The results prove in principle that a hybrid quantum network is possible and can be scaled up for use in a quantum network. This achievement thus demonstrates, for the first time, that a "hybrid" quantum computer might be assembled from different hardware types, in this case a quantum dot (quantum processor) and a PDC (quantum communications bus). 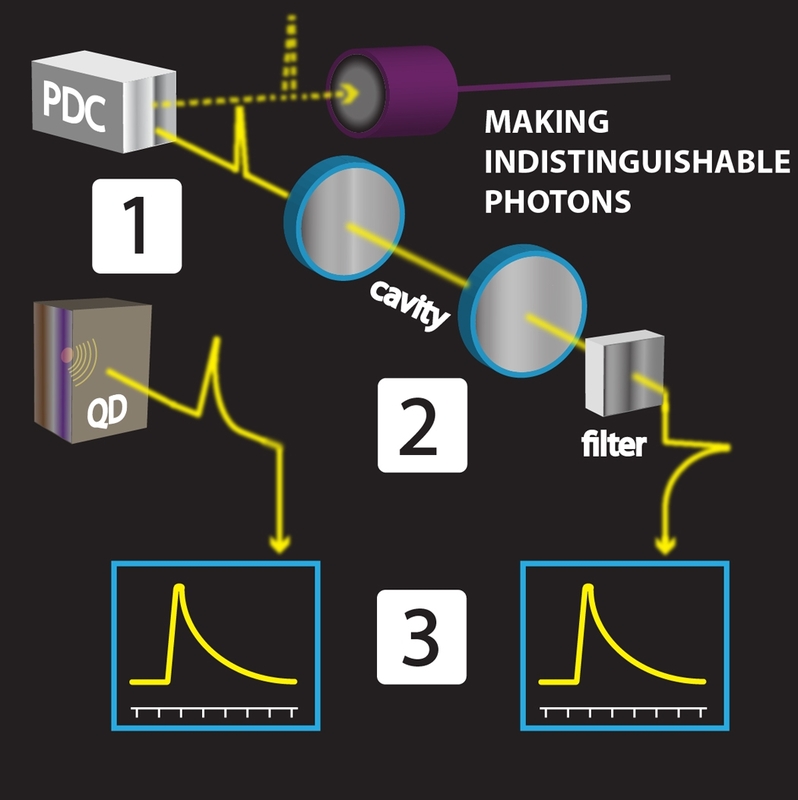 Photons created two different ways, in a parametric down converter (step 1) and in a quantum dot (step 2) can be made to be identical (step 3). Courtesy NIST-PML.